A marketing revolution is upon us. Salesforce understands the changing needs of the modern marketers and has created an entire platform to help marketers deliver exceptional customer experiences, from the first touch point to well after a purchase has been made. 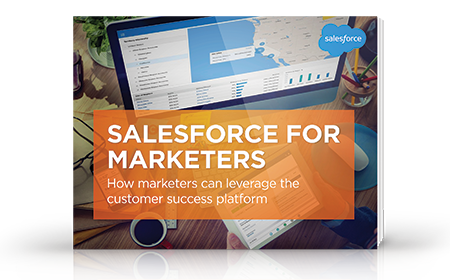 This e-book explores the many options marketers have, in addition to the Marketing Cloud, to create compelling 1:1 marketing that leads to customer success. By the time you’ve finished it, you will have a much better understanding of how marketers can leverage the entire Salesforce Customer Success Platform, from sales to service, app development to online communities. Find out how Salesforce enables brands to deliver exceptional experiences and the many more ways you can become a customer company.